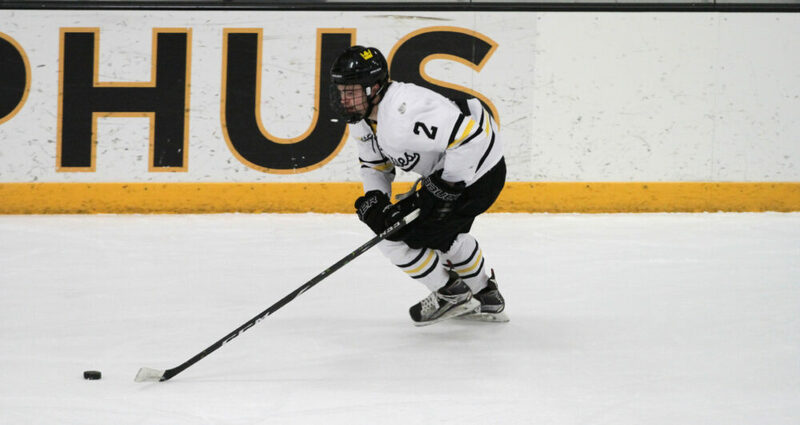 MOORHEAD, Minn. – The Gustavus men’s hockey team Friday lost a gut-wrenching 4-3 overtime decision at Concordia. The sudden death game-winning goal came on a two-on-one breakaway with just four seconds left on the clock. The loss drops the Gusties to 7-14-1 overall and 4-8-1 in the MIAC, while the Cobbers improve to 12-7-3 overall and 8-3-2 in the league, clinching a spot in the MIAC postseason tournament. It only took 39 seconds into the game for the Gusties to score as Logan Norman (So., Luverne, Minn.) found the back of the net with the help of Tyler Rock (So., Savage, Minn.) and Will LeNeave (So., Medina, Minn.). The Cobbers were able to respond at the 7:22 mark and the score remained tied at the first intermission. It took even less time for the Gusties to regain their lead to start the second period as Colton Schmidt (Sr., Eden Prairie, Minn.) tallied his fifth goal of the season 33 seconds into the frame. Two minutes later though, Concordia evened the score once again. The Cobbers then took a 3-2 lead at the 11:02 mark of the third period on a power play goal. Mason Etter (So., Grafton, Wis.) was able tie it up once again with his third goal of the season with 5:23 left in regulation, but the Cobbers were able to net the game-winner in overtime. Chris Amsden (Sr., Saint Peter, Minn.) suffered the loss after making 40 saves. The series concludes at 2 p.m. tomorrow.